We’d love your help. Let us know what’s wrong with this preview of Key to My Soul by Probal Mazumdar. To ask other readers questions about Key to My Soul, please sign up. Blurb- The story is about our protagonist Sidd, Siddharth and her school friend Hazel. Hazel was a new student in the school and Sid became his best friend. Their friendship grew in the school life and suddenly one day Hazel disappeared. They carried on with their lives and after so many years, one day Sid got a mysterious phone call that Hazel met with an accident and battling for life. Read future to unfold the plot. ▶️ Nice plot. Good emotional read for romance lovers. ▶️ Good use of language and vocabulary. ▶️ Plot has more twists and turns that holds your attention till the end. ▶️ I rarely like book of romance genre but this one I liked. ▶️ I love the part of the book which contains letters of Hazel. That was interesting, emotional and heart touching. When you receive a call from an unknown number that the person you loved in your childhood is in hospital and fighting to live, the shock would be difficult to describe. Siddharth is going through such dilemma. He contemplates whether he should revisit his past or leave things as they were. Going back to his memory lane, the readers get to know a romantic story that didn't have a happy ending. Will Siddharth be willing to change the past or keep the status quo? I didn't expect this one to be so go When you receive a call from an unknown number that the person you loved in your childhood is in hospital and fighting to live, the shock would be difficult to describe. I didn't expect this one to be so good. The writing style is lyrical that keeps you elated throughout the book. The letters to Hazel are very charming to read. Starting from the cover of the book is a likeness of couples hand in hand, an open book, painting brush n plate on either side of the couples with a blue background. The cover is simple but can be much better. The title of the book "Key to My Soul" is interesting and gives the hint that it’s going to be romantic tale. The title is apt according to the plot. The book is the bag of emotions, friendship, innocent love, parenthood, pain, hatred, betrayal, abuse, crimes, injuries, accidents, a broken Starting from the cover of the book is a likeness of couples hand in hand, an open book, painting brush n plate on either side of the couples with a blue background. The cover is simple but can be much better. The title of the book "Key to My Soul" is interesting and gives the hint that it’s going to be romantic tale. The title is apt according to the plot. The book is the bag of emotions, friendship, innocent love, parenthood, pain, hatred, betrayal, abuse, crimes, injuries, accidents, a broken marriage, depression, anxiety, separation, hurt, suspense, revenge, mystery, tragedy and much more. This is the story of protagonist Siddharth and Hazel. The story starts with Siddharth receiving a call from an unknown person who informs him that his childhood love Hazel had met with an accident and lying in a coma state at Jamshedpur hospital and he had the key to the letters which Hazel had written for him fifteen years back which couldn't be able to reach him due to some reasons. Then the story enters into the flash back of Hazel and Siddharth school days and their innocent love, with some funny friends. The sweet relationship is broken up because of some unexpected incidents happened in her life and then they were separated. They were separated by destiny and fate had some other plans stored for them after seventeen years of separation they are going to meet again. Siddharth leaves to his hometown to meet Hazel and the letters which she had left for him. What are the letters Hazel had written for Siddharth? Do these love birds will have a happy reunion? Is it a happy ending? Who was the unknown caller? To know more read the book. Each and every character with utmost significance of their own and every one of them has done justice to their respective roles throughout the story, thus making it easy for the reader to relate to them, their views, their actions and reactions. The author’s mastery over the language is evident from the terms he had used and the vivid description of events that unfold in the pages of the book.It was nice to read a well-edited, proofread book. The storytelling was good and narration is fine with various twists and turns throughout the book. At some points, it seems dragged and stretched a bit too far. Though the story was a little predictable at parts, it kept me engaged. There are some wonderful one liners and shayries in the book which I loved. It's a great book which could be turned into a Bollywood movie. "My love is like ether. It will survive winds or fires, flooding waters or a barren earth. My love will exist like the fifth element." The title Key to my Soul makes it sound like a sappy romance which will probably end with Hazel being the Key to Siddharth’s soul. However that is not the case at all. This book follows the lives of two people – Hazel and Siddharth. When Siddharth gets a phone call from his friend that Hazel(a mysterious person in the beginning) is in coma he starts going back down memory lane and contemplating whether or not he should go check on her. Even though this book is huge and pretty much obvious in terms of will Hazel wake up or not, what attracted me most were the writing style and the way in which the narrative was recorded. We follow along with Siddharth, (whom I genuinely liked because of the mid-life crisis situation that was going on in his life) as he reads the letters and remembers Hazel. We don’t really “meet” the present day Hazel and her character is developed all through the letters and memory, so as a reader I was unsure of the reliability factor there. However the past is a haunting place for him and we see him through it all. The author did a remarkable job in making the characters dilemma real, or else this could’ve been another flat story. There are numerous sub-plots, which do tie up in the end but my own drawback of this book is that, sometimes there were too many sub-plots and it just felt like the author was trying to move the action along, that felt a bit forced. The novel is very If I Stay kinds. The biggest feat was that by the end we, along with Siddharth, want Hazel to wake up. I really wanted to know more about Hazel, even though she started as a pretty mediocre young adult character. The book managed to keep my attention at all times, and did a fantastic job of creating a believable love story. I would urge anyone who wants to read great, thoughtful Romance that has a mysterious element, to pick this up. You won’t be disappointed. And was flapping within my rib cage. But it found its way to this page”. Sidharth and Hazel study in school together. They are opposites and opposites attract. Sidharth a loner and introvert. Hazel is star of the school. As happens in love stories they come close. Then some tragedy sends them apart never to meet again? Or will they meet? The story starts in the steel town of Jamshedpur. The town life revolved around the plant. Sidharth is a poet and painter. He has a collection of Indian poets. He was known as a prodigious painter in school. Hazel is an athlete. She won trophies as well as hearts. The book recollects the famous events from Indian and world history as the story progresses. This helps us to locate the events of story in real time. This is a good technique to ground the story firmly in the time period I noticed the same technique in the Web Series “Sacred Games” where Ganesh Gaitonde character recounts his life with Indian history events. The story is slow but engaging. The prose is beautiful. It is a good book for lovers of romance. 3/ 5 stars. Love can make you happier than you've ever been, sadder than you've ever been, angrier than you've ever been. It can elate you and deflate you almost at the same time. It is the best thing that can happen to you ever. It is the feeling that can’t be expressed in words. Yet ‘Probal Mazumdar’ tried his best to pen down this beautiful feeling in his book ‘Key to my soul’ and I can definitely say that he succeeded to express this beautiful thing called love in his book. ‘Key to my soul’ is a perfect Love can make you happier than you've ever been, sadder than you've ever been, angrier than you've ever been. It can elate you and deflate you almost at the same time. It is the best thing that can happen to you ever. It is the feeling that can’t be expressed in words. Yet ‘Probal Mazumdar’ tried his best to pen down this beautiful feeling in his book ‘Key to my soul’ and I can definitely say that he succeeded to express this beautiful thing called love in his book. ‘Key to my soul’ is a perfect articulation of a love story of two innocent teen Siddharth and Hazel who didn’t realize that the bond got deeper with time. It all started with friendship and they didn’t know that they mean so much for each other. Hazel was very good in athletics and Siddharth was a very good painter and a very good person by heart. It is because of Siddharth’s painting that they talked for the first time. With time, they became friends and then started loving each other. But due to some mishappening, they had to move on in their lives without each other. After many years, one day, Siddharth got a call from some unknown person explaining the condition of Hazel that she met with an accident. Getting this news, Siddharth was bewildered, his world shattered into pieces. His past was in front of his eyes. He didn’t know what he should do. The caller also told him about letters that she left fifteen years back. With all the ups and downs in life, somehow Siddharth and Hazel were destined to meet again. 	My love will shine like the moon when the light in the lanterns fade away. 	My love is like ether. It will survive winds or fires, flooding waters or a barren earth. My love will exist like the fifth element. Overall, the plot is amazing and something different from the love stories that I read till date. Hazel’s letters brought tears in my eyes, I literally felt the pain that Siddharth was feeling while reading those letters. This story contains many emotions- love, hatred, betrayal, parenthood, pain after heart breaks and many more. I can say after reading this book that ‘Probal Mazumdar’ worked really hard on the plot so that reader can imagine the character on their own while reading the book. I would recommend this book to my friends who think that once they lost someone, they lost that person forever. I want them to know that it is all destiny. If they were destined to meet, they will. No one can stop them! Key to My Soul is an out and out love story. The journey of a man, who learns of his long lost sweetheart has met with an accident and is critical in the same town they had initially met as school sweethearts. His quest to find that feeling of love once again. The book is an ode to his one true love, the sweet, beautiful, generous Hazel. He receives a mysterious phone call and is informed of the love letters Hazel had written to him as well as the reasons for their breakup. The story is fast, alm Key to My Soul is an out and out love story. The journey of a man, who learns of his long lost sweetheart has met with an accident and is critical in the same town they had initially met as school sweethearts. His quest to find that feeling of love once again. The book is an ode to his one true love, the sweet, beautiful, generous Hazel. He receives a mysterious phone call and is informed of the love letters Hazel had written to him as well as the reasons for their breakup. The story is fast, almost in every chapter, there is a new revelation or twist in the love story. The book is a poignant reminder of true love and the acute loss both Hazel and Siddharth feel once they are separated. The book has a series of letters that unravel the mystery of their breakup, which Hazel has written. Letters that show the obstacles both of them faced and how they cannot move past each other. Abuse, crimes, injuries, accidents, a broken marriage, an incomplete life and the acute melancholy that surrounds the lovers makes you root for both of them even when their union seems impossible. The path to love is never easy but Probal has written about so many layers of love in the book that it is a sweet read. I did find the attacks on Siddharth and his father a bit too ‘filmy’, a typical Bollywood style. Also, I felt his father could have been more forthcoming about the sudden change that happened as well as the violence. However, since the book moves from their teenage, as parents we tend to shield our kids from evil as much as possible. Hazel’s mother did the same to protect her so it does work for the story. The added depth of characters as they interact with the parents, friends and the wife made for a good read. The storyline reads true to life, the small town fell making it more realistic and almost like a friend’s love story. Key to My Soul by Probal Mazumdar is story of a couple, Sidharth and Hazel. Sidharth, a lonely young man with failed marriage gets a sudden call from someone, through whom he learns about his childhood lover, Hazel and her critical condition. He also gets to know about the letters she wrote for him 15 years back. It disturbs him to core and he wants to go and meet her. Will he able to meet her? What's there in those undelivered letters? Why she didn't gave those letters to him? What plans destin Key to My Soul by Probal Mazumdar is story of a couple, Sidharth and Hazel. Sidharth, a lonely young man with failed marriage gets a sudden call from someone, through whom he learns about his childhood lover, Hazel and her critical condition. He also gets to know about the letters she wrote for him 15 years back. It disturbs him to core and he wants to go and meet her. Will he able to meet her? What's there in those undelivered letters? Why she didn't gave those letters to him? What plans destiny have in store for them? To discover more about Siddharth and Hazel all you have to do is, give it a read. Cover looks pleasant and title interests reader's mind. Narration is simple yet bit lagged at places. Language used is simple and understandable. Editing could have been better. Error free narration. Over all a good simple story that everyone can easy relate to. The title of the book and the cover design gives an impression of a romantic journey in the pages; however, the beginning of the story speaks of a physical assault to the protagonist giving you a hint that this book is more than just a vanilla love story. For me, the author has managed to hook me to the story right at the start. As the blurb says, the protagonist Siddharth (Sid) goes back to find her childhood sweetheart in a state of coma. The story revolves around the flashback of childhood and letters that Sid should have received about 15 years back; and if he actually did that, his life would have been completely different. It is no secret that Hazel will recover from the coma for a happy ending; but what is noteworthy is all the sub-plots that takes shape while the girl is in coma…well that’s what makes the story. Nevertheless the shocking revelations in those letters are the events that kind of takes the story forward. The story has a good blend of flashback and present situations. It seems that the author has done good research, as the details chalked are very clear. The events listed down appears so unique and vivid that, at certain points you might think if the author is actually sharing the incidents of his life. It is an interesting, light-read; language is simple. Basically, the story is all about realizing and acknowledging one’s mistakes, getting over the past and rectifying the unhappy past in order to ensure a better future. Although, some of the events of childhood mentioned does not help in the pace of the story; though are not boring to read, it could have been avoided. The cover is simple yet catchy and elegant, with a guy holding the hand of his love. The title is very enticing and beautiful, such a connect of love with soul. The blurb is the usb of this novel. I mean it's written so well. The blurb created such an interest about the plot of the story. The story is based on the love as well as the suffering experienced by both the main characters Siddharth and Hazel. The emotional connect between them is something which any individual can relate with. The characterisation is really good. All the characters are so relatable, so real. What added to the story are the letters and the snippets of poetry. Such things add to the beauty of the reading experience. The narration was adequately paced and engaging. I was awestruck by the climax, it was quite surprising. All in all, Key to my soul is a modern day novel which has all the elements, friendship, heartbreak, love, surprise and emotions. This book is such a heartwarming tale of love that at the end you cannot help but feel mushy. Written with such details that the author teleports you the past and takes you along as the lead characters grow together and fall in love this is one amazing read. The language was really easy-peasy and I don't think anyone would have any problem understanding it. The narration was really good and subtle but the only drawback was that I could spot some grammar and punctuation errors. Also, there were some mistakes in the tense. Another thing which I would like to say is that since the story is narrated from Siddharth's point of view and the author only left some bits and pieces of Hazel's life, after a time it kind of started feeling monotonous to me. I mean, when you have a female protagonist in your plotline, you should also give her some space to make appearances. So, the tini tiny glimpses wasn't enough for me. I would have loved if I could delve deeper into her life and really connect with her. Also, throughout the book what actually happened to Hazel was not mentioned in clear alphabets. The author only dropped some hints that she is sick and in a coma and requires a surgery. Other than these plot holes, I really loved how the story flowed so well and the way the chapters were weaved in continuation to enhance the storyline. Mostly what really stood out to me about the book was the cover and the title. The author chose a the title really well and how he connected with the plotline and dropped in some title references were noteworthy. There's no caricature of vocabulary. So, the language is not really pronounced into this book; like it wouldn't really "wow" you but it isn't amateurish either. Except for the plot holes which I have mentioned, this is not a bad story at all. Everything was put down in a soft and subtle manner. No such complications no such dramatic word usage that would make you cringe. But well, the love making scene could have been written better though. If the author gives off a finishing touch and edits the grammatical errors, this has the potential to be a perfect book. So, that's all from my side. Some stories give you the chance to relive the carefree youth days when you had the first crush, did something to make someone feel special,wrote the first love letter and many such small things which touches one's heart.This story is one of those beautiful tales. Key to my soul is a beautiful blend of friendship,love,betrayal,jealousy,crime and heartbreak. The story starts with Siddharth receiving Hazel's accident news. It leaves him baffled, as the time progresses he uncovers many secrets of the past.The story is told through the male protagonist's point of view.Through his eyes we discover Hazel his childhood lover,their families,friends and other acquaintances.Bonds they all shared and the events that shaped their lives.The whole plot was revealed in the form of backstory. Author's lucid writing,steady pace and vivid description of the places and events kept me glued to the book.Beautiful casting of well etched characters undergoing various upheavals in their life.The sprinkle of poetry and use of letters makes the story quite engaging.The story has an old school charm. I liked the way author has projected mid-life crisis and parenthood.There are many subplots in the story.The story and the title compliments each other.I loved the way story ended, it indicates the mature handling of the plot. I wished to know more about Hazel,hear her side of story. At places, the subplots and certain events laxed the pace of the story.The cover could have been lot more better, it does not do justice to the story. Key to my Soul by Probal Mazumdar. Its not just a simple love story, but a medley of love, revenge, friendship, parenthood, separation, betrayal, purpose-less life, heartbreak, .... A superb feat for a debut Author. Good job Probal Mazumdar ! The layers of emotions like the paints on Siddharth's canvas. Lot many emotions going on in the story which connect with the reader and pull them along. The well-etched characters and places. The relation of the Title, Cover and story is perfect. The small snippets of poetry are endearing and deep. Shows Probal's forte and the awards he won. The connection of past with the use of letters and flashbacks and the present was seamless. Sometimes I wanted the story to race ahead. But after the book ends it all feels right. What would you do if you had a chance to meet your long-lost love and when you do you find her battling with death to survive? This is exactly what happens with Siddharth, the protagonist of the story who receives a mysterious call which informs her that his love Hazel with whom he lost touch almost seventeen years ago is breathing her last few breaths and he must see her. He is also informed of a series of hand-written letters which Hazel left for him which were never delivered to him. If they What would you do if you had a chance to meet your long-lost love and when you do you find her battling with death to survive? This is exactly what happens with Siddharth, the protagonist of the story who receives a mysterious call which informs her that his love Hazel with whom he lost touch almost seventeen years ago is breathing her last few breaths and he must see her. He is also informed of a series of hand-written letters which Hazel left for him which were never delivered to him. If they were delivered, the story would have been different. Siddharth who is struggling with a failed marriage decides to pay Hazel a visit as he couldn’t bring himself to accept the fact that she was dying and also he was intrigued by the fact that she left him letters. Eager to know the contents of those letters he pays a visit to Jamshedpur, his hometown where he first fell in love with Hazel and where they were separated due to some unfavorable circumstances. What happens when he finds those letters and comes to know about Hazel’s life? What happens to Hazel and who was that mysterious caller who informed Sid about her condition? This story was about lost love, pain, separation and friendship. The plot was good and the story was narrated beautifully. I enjoyed reading the book and it is a light read so anyone can pick it. The language is kept simple so I finished the book in one sitting. There were a few mistakes here and there but not major ones. I think the end of the book was rushed and could be presented in a better way. I will give it 3 stars. The story is laid before the readers with such simplicity that readers without any doubt could fall for his words if he/she is ready to get involved in teenage kinds of stuff. The point on which story kicked off gained my interest. There our writer, Probal hanged crisps of suspense, and to reach to those crisps, I started this journey. To be very honest, I was not pleased with the teenage stuff. Every story in that time of life, have same aroma and same dignity. I was more interested to know how The story is laid before the readers with such simplicity that readers without any doubt could fall for his words if he/she is ready to get involved in teenage kinds of stuff. The point on which story kicked off gained my interest. There our writer, Probal hanged crisps of suspense, and to reach to those crisps, I started this journey. To be very honest, I was not pleased with the teenage stuff. Every story in that time of life, have same aroma and same dignity. I was more interested to know how the present situation unfurled, and how the story would take a turn. The story took a turn on such an unexpected note, that I couldn't de-attached myself from the book. I didn't expect that it would serve me something like that. And when the unexpected events started to roll down, it didn't stop. The story started to move with such enigma that it completely grabbed me in its tugs. There was nothing that I could expect in advance. I was excited with the bunch of surprises this story offered me. Enjoying every depth of the story, I found myself completely lost in the story. A simple yet complicated love story of Sid and Hazel, spanned over two decades with its various turns and twists. Time and era of the storyline is nicely depicted here through the use of various contemporary events which made me reminisce the eighties and nineties when I grew up. This book nicely portrays love, friendship, betrayal and family values. Overall I must say a great job done by the author. After i read this book i felt that this book has put forth "a great story that has been detailed to the clearest possible extent and emotions can be felt"
the plot of the book though looks like a simple love story has lot of twists/turns and keeps glued till the end. The author has put forward some nice reminders of a different era along with world highlights during that time as he walks the reader through the different twists. impressed by authors ability to twist the words. kept my glued till th After i read this book i felt that this book has put forth "a great story that has been detailed to the clearest possible extent and emotions can be felt"
impressed by authors ability to twist the words. kept my glued till the end. 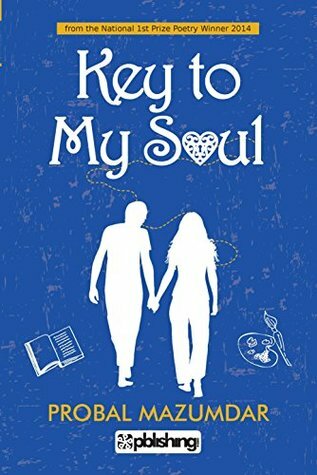 "Key to My Soul" is a romantic story. The novel as a whole is a combination of flashbacks. The protagonist, Siddharth receives an anonymous call that his first love Hazel has met with an accident. The caller talks about some letters. Siddharth then goes into flashback, precisely 17 years since their separation. The story is based on love as well as the suffering experienced by both the main characters Siddharth and Hazel. The author writes poetry. He uses elements of poetry to write evocative pr "Key to My Soul" is a romantic story. The novel as a whole is a combination of flashbacks. The protagonist, Siddharth receives an anonymous call that his first love Hazel has met with an accident. The caller talks about some letters. Siddharth then goes into flashback, precisely 17 years since their separation. The story is based on love as well as the suffering experienced by both the main characters Siddharth and Hazel. The author writes poetry. He uses elements of poetry to write evocative prose and this makes for a great reading experience. The characters have been developed well, but the pace is probably a little slow. Overall, an excellent debut by a very talented author. Looking forward to reading more work from Probal. The book interestingly weaves lives of "Sid" and "Hazel" who start their lives as innocent and immature friends and how they discover their true self while facing strife in life. An interesting plot from the beginning, very well connected narrative throughout the book.. However, sometimes I found that characters have been described very perfect in their appearances.. We are all human and showcasing some flaws would make it more realistic. Overall, I enjoyed the book very much ! A romantic story steeped in nostalgia for me.One can so relate to the characters,the setting of the story,growing up in a small town.Though the story drags in some parts,overall an interesting read.The unsaid emotions between the father and son touches your heart. Key To My Soul is a typical coming of age love story of Sidd Banerjee and Hazel Castelinos. It’s a romantic story which starts in present, takes you back to the protagonists past, where they got acquainted, fall in love but fate separates them. Their journey after that, under what circumstances they meet again, will they get together or will fate deliver another blow, is what the story is all about. What caught my eye was the title of the story and its relevant use in bringing out the real essence of the story as well as the title. Excellent story weaving by the debutant author, who keeps the reader hooked to the story. While reading the letters you can actually feel the pain of the protagonist, you experience the love and serene surrounding of Jamshedpur. The only flaw I would like to mention is why Sidd felt fleeced by the lawyer in his divorce case. The details are not mentioned even though the author has covered all the aspects of life like before and after Hazel but left this point out. If this detail was mentioned, it would have added little more power to Sidd’s story. Other than this missing point in the story, the book is worth a read, medium paced, romantic story with little hint of mystery but well developed characters and situations. Key to my Soul is a story of true love which faces the ups and downs blown by fate and still ends up with a happy note. Kudos to the writer, whose poems added extra oomph to the otherwise beautiful story. Going from the title to the cover both are exceptionally well matching and obviously put well together. The story plot line is romantic and also reminds you of the childhood at so many points of the book. Imagery formed is natural and comes flowing. The author has does a tremendous job. STORY-LINE/ PLOT: Like sweet-salty ‘nimbu pani,’ there is a touch of romance and a touch of suspense but the end result is something cool and refreshing and heart-warming. There is subtle romance as well as some fist-fight. There is treachery as well as love and care.The book takes us on a journey of amateur love that is caught up in a storm that takes years to settle down. The storm plays havoc in the lives of the protagonists only to see them especially Hazel, emerge strong. The author has been STORY-LINE/ PLOT: Like sweet-salty ‘nimbu pani,’ there is a touch of romance and a touch of suspense but the end result is something cool and refreshing and heart-warming. There is subtle romance as well as some fist-fight. There is treachery as well as love and care.The book takes us on a journey of amateur love that is caught up in a storm that takes years to settle down. The storm plays havoc in the lives of the protagonists only to see them especially Hazel, emerge strong. The author has been able to bring out the suffering and feeling of remorse experienced by Hazel and Siddharth respectively, well. The strong bonds between the Father- son duo of Mr Banerjee and Siddharth as well as mother- daughter duo of Mary and Hazel is something one can’t miss. It is deep and one of understanding. However, one thing that I found wanting was more details on Sidharth and Kiran’s divorce. CHARACTERIZATION: The characters of all including that of the least important ones are fleshed out well. LANGUAGE: Language is simple and free-flowing. It reminded me of the water rushing in an irrigation canal in rains, cool and crystal clear. PACE: Perfect. At no point did I feel my interest wane which would not have been so if the book was unevenly paced. I read a romantic novel after a very long time. The story is a simple one-boy and girl in love-get separated due to circumstances - reunite in the end. What I like best in this book is the family relations portrayed in the story like that between the protagonist Siddharth and his father/grand mother. The other endearing thing about the book is the way the author has depicted the passage of time by connecting it to news events like Seoul Olympics and the collapse of the Soviet Union, etc. It remi I read a romantic novel after a very long time. The story is a simple one-boy and girl in love-get separated due to circumstances - reunite in the end. What I like best in this book is the family relations portrayed in the story like that between the protagonist Siddharth and his father/grand mother. The other endearing thing about the book is the way the author has depicted the passage of time by connecting it to news events like Seoul Olympics and the collapse of the Soviet Union, etc. It reminded me of my school days. Also, loved the description of Jamshedpur. Though I have never been to the city, the author has painted such vivid images of certain parts of the city like the Kali Temple that I get a feeling of familiarity with these places. It was a very good read overall. The language used, without complicating it unnecesarily, is very easy to understand. The description of various situation and things made it feel real. I liked how the mention of the historic events taking place then, take you back to those times and draws u completely into the scene. The starting 1/4th of the book felt like a little drag intially. But most of the 'descriptive events' find meaning towards the end of the book. There was no looking back after the cha It was a very good read overall. The language used, without complicating it unnecesarily, is very easy to understand. The description of various situation and things made it feel real. I liked how the mention of the historic events taking place then, take you back to those times and draws u completely into the scene. There was no looking back after the chapter "Durga puja". The turn of events ever since maintains an air of mystery throughout the story and you cannot stop flipping pages to find out 'what happenes next' (due to which i skipped my metro station and realised that only after the light intensity changed as the metro went underground) . The climax of the story was totaly unexpected. The letters unfolding Hazel's story came as a big shock not only to Sidharth but also to me, as a reader.